Massive GGGGCC repeat expansion in the first intron of the gene C9orf72 is the most common known cause of familial frontotemporal lobar degeneration (FTLD) and amyotrophic lateral sclerosis (ALS). Despite its intronic localization and lack of an ATG start codon, the repeat region is translated in all three reading frames into aggregating dipeptide-repeat (DPR) proteins, poly-(Gly-Ala), poly-(Gly-Pro) and poly-(Gly-Arg). We took an antibody-based approach to further validate the translation of DPR proteins. To test whether the antisense repeat RNA transcript is also translated, we raised antibodies against the predicted products, poly-(Ala-Pro) and poly-(Pro-Arg). Both antibodies stained p62-positive neuronal cytoplasmic inclusions throughout the cerebellum and hippocampus indicating that not only sense but also antisense strand repeats are translated into DPR proteins in the absence of ATG start codons. Protein products of both strands co-aggregate suggesting concurrent translation of both strands. Moreover, an antibody targeting the putative carboxyl terminus of DPR proteins can detect inclusion pathology in C9orf72 repeat expansion carriers suggesting that the non-ATG translation continues through the entire repeat and beyond. A highly sensitive monoclonal antibody against poly-(Gly-Arg), visualized abundant inclusion pathology in all cortical regions and some inclusions also in motoneurons. Together, our data show that the GGGGCC repeat is bidirectionally translated into five distinct DPR proteins that co-aggregate in the characteristic p62-positive TDP-43 negative inclusions found in FTLD/ALS cases with C9orf72 repeat expansion. 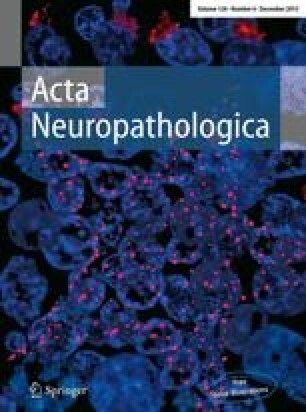 Novel monoclonal antibodies against poly-(Gly-Arg) will facilitate pathological diagnosis of C9orf72 FTLD/ALS. K. Mori and T. Arzberger contributed equally. The online version of this article (doi: 10.1007/s00401-013-1189-3) contains supplementary material, which is available to authorized users. We thank T. Bachhuber, J. Banzhaf-Strathmann, D. Orozco, B. Schmid, B. Schwenk for helpful discussion. We thank M. K. Schmidt, B. Kraft, I. Pigur for excellent technical assistance. This project was supported by a grant of the Centres of Excellence in Neurodegeneration Research (CoEN) to MC, CVB, CH and DE and the Competence Network for Neurodegenerative Diseases (KNDD) of the Bundesministerium für Bildung und Forschung (BMBF) to CH. KM was supported by a postdoctoral fellowship from the Alexander von Humboldt Foundation. DE was supported by the Helmholtz Young Investigator program. The research leading to these results has received funding from the European Research Council under the European Union’s Seventh Framework Programme (FP7/2007-2013)/ERC Grant agreement n°321366-Amyloid to CH. We acknowledge the VIB Genetic Service Facility and the Antwerp biobank of the Institute Born-Bunge for brain samples, as well as T. Van Langenhove, S. Engelborghs, P. P. De Deyn, A. Sieben and J.-J. Martin for genetic, clinical and pathological diagnoses and brain sectioning and diagnostic immunohistochemistry. The Antwerp site is supported by the MetLife Foundation Award (to CVB), the Belgian Science Policy Office Interuniversity Attraction Poles program; the Foundation for Alzheimer Research (SAO/FRA); the Medical Foundation Queen Elisabeth; the Flemish Government Methusalem excellence program; the Research Foundation Flanders (FWO) and the University of Antwerp Research Fund. I.G. and J.v.d.Z. receive a postdoctoral fellowship of the FWO.